← Overlooked and left behind? On Saturday 23rd April 2016, over a hundred of John Playfair’s friends joined his family for a concert of clarinet music ranging from Mozart to Cole Porter held at St.Michael’s and All Angels church in Turnham Green, London. My school piano teacher – he was the third or fourth to have battled with my inability to control two independent hands – suggested despairingly that I should go along to the band room and try some other instrument. I rather fancied the saxophone, but there was only one of these, already taken, and the bandmaster, a shrewd old Scotsman, needed clarinettists, so that was that. How he did it I don’t remember, but he had me playing in the band practice that same week – third clarinet, mostly open G’s, but unquestionably music. Four years later I was playing the Weber Concertino at the end-of-term concert. I never had another proper lesson, which is probably why I never quite got to professional level, but I have held my own for fifty years in a series of amateur orchestras and wind groups. Apart from brief flirtations with the bassoon, horn and – yes, finally – saxophone, the clarinet, or a clarinet (I’ve owned at least fifty) has been a lifelong companion. It’s the perfect instrument for anyone with broad musical tastes, equally at home in the orchestra, with a string quartet, with other winds, in the military band, a New Orleans parade, a Balkan or Bohemian wedding dance. Only the Baroque (because it wasn’t invented yet) and Bebop eras are more or less out of bounds. Though simple to look at – a straight wooden tube with holes, a reed and a bell – the clarinet’s acoustics are quite peculiar, and as a scientist I soon got interested in improvements in tuning and tone-quality. A fatal step! In no time the house was full of battered cases containing instruments in various stages of testing-to-destruction. It was twenty or thirty years before I discovered the rules, abandoned my schemes for extra holes and keys, and concentrated on touching-up and re-selling old instruments. I hate to see them go and would love to have kept them all – which is where this differs from the Don Juan complex (though you can read a lot into a clarinet, with its straight pointed end and its gently expanding bell-curve; periodically I have a dream in which I come across an antique shop in some previously unknown part of London, with a stock of clarinets in shapes I’ve never before seen). When I retired from University College, instead of the standard symposium in which ex-students and colleagues struggle to present their work in such a way as to make it look as if the retiree had some benign influence on it, we had a concert which finished up with the Mozart clarinet quintet; myself and a brilliant quartet led by my daughter, which is certainly how I would want to be remembered. John Hugh Lyon Playfair was educated at Cheltenham College and Pembroke College Cambridge. After qualifying as a doctor in the 1950’s, he worked at the Marsden and Brompton hospitals and branched out into research on cancer and tropical medicine. He married his wife Line Mariani in 1959. Most of his working life was spent as reader, then professor of Immunology at the Middlesex Hospital (later University College Hospital) where he taught, wrote and researched the immunology of tropical diseases. He spent three years in the early 1960’s at the University of California, Berkeley in San Francisco and travelled extensively as part of his work for the World Health Organisation and was in great demand as a lecturer and examiner. He was an accomplished painter, draughtsman and writer, his 3 early novels were well received and he later wrote several crime novels. 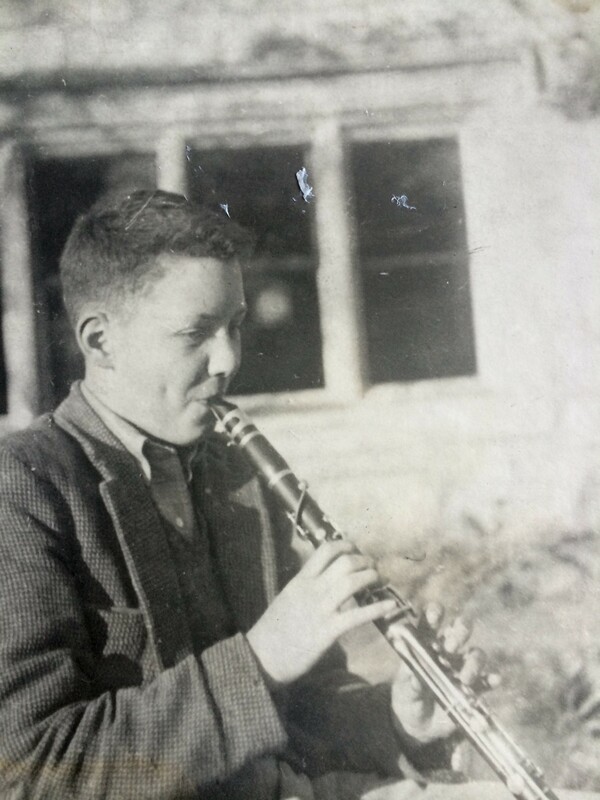 He loved playing every member of the clarinet family and arranged chamber music for the various wind ensembles. Many of his rare clarinets have been donated to Edinburgh University’s Sir Nicholas Shackleton Collection with the expert help of his friend Alex Allen. John’s sense of humour and wide range of interests made him a great friend and companion and his life was spent pursuing his many passions. He was much loved and is sadly missed by his wife Line, brother Guy, daughter Miranda, son Edward, four grandchildren and his many friends. This entry was posted in Culture and tagged clarinet, John Playfair, music. Bookmark the permalink.